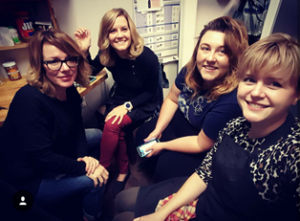 If you have ever ventured into Salon Enso, or if you are one of the amazing individuals that follows us on any of our social media accounts (Twitter, Pinterest, Facebook, Instagram) you will see a group of 12 ladies that love one another like no other. I work with some incredible women. They are tough, talented, creative and funny as hell. I’m sure you’ve heard peals of laughter from the back room. They are also completely compassionate and encouraging. We love to see one another succeed, whether it is behind the chair or a personal goal. We build one another up. I’m remarkably fortunate to be part of such a dynamic crew. I’m fortunate to not only call these ladies colleagues, but friends as well. The connection extends well beyond the walls of Salon Enso. We are there with an ear in times of need, treating with coffee in times of exhaustion and with chocolate for times of…well, who doesn’t like chocolate at any time?! Even though we have come from all walks of life, have different hobbies, wheelhouses and outward circles of friends, magic occurs between four walls when we all get together. Lasting friendships are a tricky thing. You never know who you are going to jive with. Like attracts like, opposites attract, you say tomato and I say toma-toe, or WA-ter vs. WOOT-er. I’ve been fortunate throughout the last decade or so to find some wonderful females to dub my girlfriends. These are ladies that have seen me at my best, at my worst and stuffing my face with fries and cake. We listen to one another moan about our significant others, that our pants feel too tight for the day, our undergarments are pinching us or that sometimes we just need a hug. We complement one another on everything from shoes (and I do love me some shoes…), to lipstick to hairstyles. And if you can’t do things like that with your friends, who can you do them with? My list of gal pals comes from nearly every walk of life and profession. My nearest and dearest is a psychologist. I’m also tight with an esthetician, a massage therapist, salon owners, school teachers, stay at home moms (this is a full time job), boutique owners, bloggers, designers, artists and (surprise!) other stylists. I feel so lucky to have such a wide variety of friends – especially those that inspire me on a daily basis. I love these women for consistently expanding my wheelhouse. It takes guts to open up your own business, patience to take care of kiddos other than your own and constant imagination to be a designer and artist. As we all know, February is home to everyone’s favorite Hallmark holiday, Valentine’s Day. 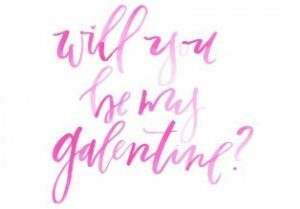 But I would like to go one further (even though I have three valentines at home) and dedicate this blog post to all my GALentines. All the women in my life that make it so much richer by being in it – and to the women that inspire them. So with that: Darcy, Emily, Keisha, Danielle, Molly, Kelly, Lisa, Susan, Janelle, Renee, Bethany, Wendy, Lauren, Casey, Melanie, Stephanie, Kristin, Nicole, Crystal, Amy, Mom, Juls – I love you all and thank you for being my friends. Also, thank you for being you, for doing what you do and for having fries and chocolate when need be.